Nancy Leigh DeMoss: So what's the Bible all about? Here's what Jen Wilkin says . . .
Jen Wilkin: The Bible, from Genesis to Revelation, is a shameless, unapologetic, glorious declaration of the nature and character of God. Nancy: Now, that may seem like an obvious answer, but Jen Wilkin says that in real life a lot of us are tempted to think the Bible is actually about us. She's about to explain what she means. Leslie Basham: This is the Revive Our Hearts with Nancy Leigh DeMoss for Wednesday, June 17, 2015. Nancy: Imagine telling one of your children to randomly open their algebra book and read whatever their eye falls on for a few minutes. Do you think there's any chance they'd learn algebra that way? Well, today we're going to talk about something far more important that algebra! We're going to discuss knowing God's Word. We'll hear from Jen Wilkin about some of the ineffective approaches we can take to studying God's Word, and she'll tell us how to be more purposeful and effective. 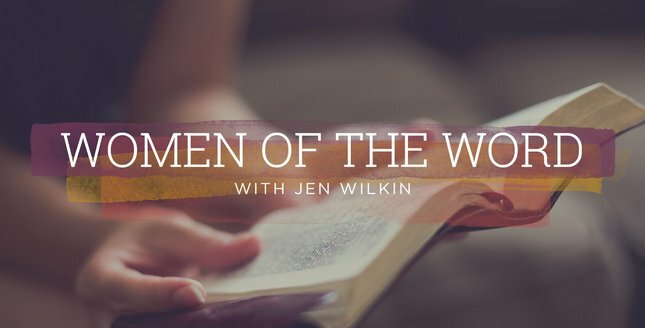 Jen explains all of this and more in her excellent book Women of the Word. I'll tell you how to get a copy at the end of today's program. Our team caught up with Jen earlier this year at The Gospel Coalition's national conference. She'll explain how to be more effective at Bible reading in a few minutes, but first, let's identify some of the ineffective ways we can approach Scripture. Remember at the beginning of the program we said the Bible is all about God. Jen says that truth is so easy to forget. Jen: I think most of would say, off the top of our heads, "Oh, certainly the Bible is a book about God." But when we are actually interacting with it, we often don't treat it as though it is . . . and we've slipped into it without noticing it. I don't think anybody sets out to spend time in the Scriptures diminishing or overlooking the fact that they are about God, but there are a lot of voices speaking into how we're supposed to interact with this Book. Sometimes we reach a place where we're almost always interacting with it second- or third-hand. We're hearing sermons or podcasts or reading books about the Bible. It can be easy to sort of lose sight of just the pure idea that its primary purpose is to reveal who God is. Just as we would say that the primary purpose of the Grand Canyon is to wake us up to the truth that there is a God, and He is massive, and He does wonders. Those are those broad brush strokes that tell us about the nature and character of God—that are obvious to anyone, believer or not. The Bible is this fine-tipped pen drawing of this same God, and it is saying the same thing. I always say that we would be crazy to stand at the edge of the Grand Canyon and look out at it and think big thoughts of ourselves. How much more crazy are we to open our Bibles and look to them to find deep truths or wonders about ourselves, rather than about the One whom the Book is truly about. So the first thing we need to turn around with women, usually, when we approach the Bible, is that we tend to read the Bible as though it is a book about us. We don't always realize we're doing this, but we feel like, "Oh, I need something from it today. I need something that's going to help me get through my day." We go to it looking for comfort or guidance, and those are good things to look for in the Scripture, but we have to remember that the Bible is first and foremost a Book about God. That means that any comfort or guidance that we're going to be taking from it needs to be taken with that perspective in mind. So instead of reading the text and first asking, "What does this have to say to me?" We read it first asking, "What does this have to say about God?" Because the reality is, there's no true knowledge of self apart from the knowledge of God. We think that we are righteous until we behold the righteousness of God in Scripture, and then we have a new understanding about human righteousness, and we see the distance there. We realize, "I need to repent!" and then we cry out to the Lord and ask Him to change our desires. That is wisdom and comfort we can take from Scripture—knowing He will transform our hearts. But that's a different way of taking comfort or drawing application from the Scriptures than if we first just go and place ourselves at the center of a book that is, from Genesis to Revelation (from beginning to end) telling us about the nature of God. Nancy: So, say you do realize that God's Word is about God and not about me and now you want to begin reading it with that in mind. Well, there are a few habits to watch for as you begin reading. The first approach Jen Wilkin warns against is what she calls "the pinball approach." Jen: The "pinball approach" to time in the Word is when I have really good intentions—I want to spend time in Scripture—but I don't really have a formed opinion on where I should start. So I pull back the plunger of my good intentions, and I send the ball of my ignorance hurtling around these different passages of Scripture. I might start in the Psalms and read there for a while and think, Oh, that's interesting. Then maybe I'll flip over to Matthew . . . or . . . now, I think I'll just go over here to Exodus. It's all good. The Holy Spirit's going to make sense of this and lead me wherever I need to go. I think it's nice to want to spend time in Scripture and seeing different things, but that type of an approach only gives you a spot knowledge of Scripture. It doesn't help you build a comprehensive understanding. Our time would be better invested if we picked a book, started at the beginning and started working our way through, trying to ask big questions about the book and trying to gain a comprehensive understanding about it. Nancy: Now, I've heard stories of people who did randomly turn to a Bible passage and the Lord did use His Word to speak to their situation that way. I've had that happen on occasion in my own life. But Jen says, just because God may choose to use that approach, that doesn't make it the normal, best, healthiest way to approach Scripture. Jen: I would never want to say, across the board, that God never speaks through His Word in unexpected ways. The difficulty we get into is when we want that to be normative or when we rely on it. I think it's interesting, the story of Gideon . . . I just covered it in a study of Judges that I was teaching. Here's Gideon who wants the clear sign from the Lord. He doesn't have a Bible that he can flip open and point to a verse, but he's going to lay out his fleece, he's going to make sure that there is some clear reaction from God to show that God is for him. And yet, even when God does exactly what he wants, Gideon gains no increased trust for the Lord from it, because Gideon is the one who is designing the sign. Gideon is the one who is calling the shots. I think there's an important lesson for us there. Are we going to ask God to reassure us on our terms? Are we going to ask God to reveal Himself to us on our terms? We dare not stand before the burning bush of God's glory and say, "Tell me who You are in the way that I would like to hear it." Nancy: So Jen Wilkin warns us about the pinball approach to Scripture. She also cautions against another way some people come to God's Word—what she calls the "Xanax approach." It's approaching God's Word as a medication for whatever emotional need we may feel. Jen: We have a bad day, and we want to feel better. Say I'm anxious because something's been going on at work, and I want to get rid of that anxiety, so I'm going to medicate it by looking up a verse that says, "Be anxious for nothing, but in all things cast your cares on Him." I'm going to look at all these familiar verses. Or maybe I'm really, really tired, so I'm going to look up the verse that says, "Come to me all ye who are weary and heavy laden and I will give you rest." Now, never mind that that passage is talking about rest for your souls, because I'm just tired, and I want to hear something that will perk me up. Or maybe I felt kind of frumpy today, so I'm going to look up Psalm 139 and find out that I'm "fearfully and wonderfully made." When we are treating the Bible in this way, we're asking it to medicate whatever our current crisis is. The reality of that approach is, I am never going to read Jeremiah 17:9 that tells me that the heart is deceitful and desperately wicked. That is not going to give me a better day. I am not going to put that on Instagram for all of my friends to read. So we end up with a highly selective reading of Scripture when we're looking to fix whatever our emotional need is for the time being. Nancy: Now, I do get a lot of comfort from God's Word. Is that okay? Jen says that studying God's Word purposefully ultimately provides the greatest source of true comfort. Jen: We should definitely be able to go to Scripture for comfort. The problem is, when we ask to have that comfort on our own terms. There is really no true and lasting comfort taken from the Scripture when we just ask the Bible to serve our whims . . . to make us feel a certain way or to do something for us. We get comfort from how He interacts with those that He loves, how He delivers us and preserves us and is longsuffering towards us. Those are all full of comfort. When we are only pulling from here or here or here, trying to piece together comfort according to our own terms, it will only last for us as long as that particular circumstance or moment lasts. We're not building towards a bigger understanding of, "I am so safe with this God! Because the more I learn about Him from Scripture, the bigger He gets and the better He gets." Nancy: Rather than just going to Scripture in a crisis, Jen encourages us to be building up the truth in our minds consistently. That way, when there is a crisis, we'll be ready for it, because we've already been soaking in God's Word. Jen: The problem we get into is that we regard our time in the Word as a debit account rather than a savings account. So we want to "put our card in" and make our "withdrawal," either for that moment or for that day. It's better to regard our time in the Word as a savings account rather than a debit account . . . where each day we are faithfully putting deposits in. That means I may spend my fifteen or thirty minutes in the Word that morning and not walk away with some warm feeling or something that I can really hang onto. It may be that I get to the end of the passage and think, I don't really know what to make of that today. I'm going to put it in there. I'm going to make my deposit, and I'm going to ask the Lord to keep building on that, that someday there's going to be a return on that. It might be this week, it might be next month, it might be ten years from now. I think when we're in a time of crisis, that is not a time when you're going to start doing inductive Bible study. It is not a time where you're going to be like, "Let me make sure I read for context and got everything." You are trying to get through the crisis! It's in those times when you want to have the savings account in which you've put these investments, and you've asked the Lord to bring a return. Then when I hear Psalm 139 I know what that is about, because I've spent enough time in there over the years and I know what comes before the verse I'm looking at and what comes after, and it yields true comfort to me in the time that I need it. Nancy: We study God's Word and store it up whether we feel like it or not. Jen: I thank that when we study Scripture, we should feel deeply, but I think when feeling deeply is our object rather than knowing God, that's where things can get off-kilter. If that's what we need from it, I think it changes the way we're going to read. We should come to Scripture knowing that when we see a vision of God high and lifted up, we will definitely have an emotional response to that, but it's one that is informed by the declaration of who He is rather than just some sort of human desire to feel something—to feel moved or to feel close to the Lord. Those emotions for Him are enhanced and deepened the more we know Him. "To know Him is to love Him," is certainly true of God. But I think that we can sometimes forget what it means to ask of the Scriptures, "How can I know the Lord better?" rather than "How can I feel a warm feeling toward the Lord?" We don't trust that. As we know Him, our love for Him will deepen, but that is exactly what happens. Nancy: Jen has warned us about randomly reading the Bible, and against reading it primarily for how it makes us feel. Instead, she encourages a more disciplined approach. Jen: I think the idea of being a disciple holds as its primary definition that we're learners. That's what that word means. And in that word "disciple," you can hear that word "discipline." When we come to the Scriptures we should understand that God does reveal Himself to us there, but it does take discipline. Just like anything else in the Christian life, this is a discipline, too. I think a lot of times we think, Well the Bible should just kind of open up for me, because I have the Holy Spirit. So He should just reveal to me the truth that I should know. And certainly, the Holy Spirit does that. He speaks through Scripture to us. But God tells us that we're to love Him with our minds, and that process of loving Him with our minds is a discipline. If you think about any other discipline that you've pursued—whether it was learning a foreign language or learning to play a musical instrument—the very first lesson you had was really hard, and you felt really dumb, and you probably wanted to quit. But over time you grew more proficient at it, and the more proficient you became, the more enjoyment you drew from it and the more beauty you saw in it. The same is true of God. Nancy: Part of learning to interpret the Bible is to learn what interpretation is, in general. Jen: We have a challenge with not just understanding the Bible on its own terms. We have a challenge of just understanding any book on its own terms. I would say we have literacy issues within our society as a whole. As a subset as that, we have Bible literacy issues. Bible literacy means you have a Bible in your own language, and you are able to understand it, and you're moving towards greater understanding of it. In order to gain Bible literacy, often what we need to do is just treat the Bible with the same level of respect that we would treat any other book. I would never pick up an algebra textbook and flip to chapter five and read a paragraph and then think on it for a few minutes and ask how it was supposed to change my life. And in algebra class I certainly wouldn't come back week after week and sit down and do the same thing—opening to a passage and reading it and wanting my life changed. That's not teaching the algebra. I'm not gaining an organized comprehensive knowledge of it. There is a structured way to go about learning things. The Bible is way more than just a book, but it is certainly a book, and we ought to accord to it at least the respect that we give to a common algebra textbook. Nancy: Jen says one way to begin rightly interpreting the Bible is to understand the context in which it was written. Jen: I came across this article that was really interesting. Any time in Rome when you want to start new construction, you have to call in the archeologists, because Rome is a city on top of a city. It's actually a city upon top of many layers of Rome. So anytime you have to dig in Rome, any time you have to begin new construction, you're probably going to dig through your floor into something of historical significance. Because it is so significant, you have to call the officials and see if you're allowed to do whatever it is that you're going to do, because there's a sense of, "We need to preserve the original structure here because it matters. It has historical value." I thought about that and how it compares to the way we read Scripture. The Bible has an original audience that it was written to before it was written to me. When I begin digging in Scripture, I need to make sure that I "call in the archeologists," that I know exactly what it is that I'm looking at. Who was this written to originally? What was going on in the culture at the time? What was the basic historical setting for this? What were some of the political forces that were in place at the time? I'm not a biblical historian. Those are not things that I just naturally know when I wake up in the morning. But the body of Christ has been gifted with people who have done this good work to help us to be able to enter into the world of the people to whom the Bible was originally written. We can't properly understand what it has to say to us until we have tried to understand what it had to say to them. I think when people hear that they sometimes feel like it will diminish their joy in Scripture if it has to mean something to them only secondarily to what it could have meant to its original hearers. But I have only ever found it to expand my joy—to know that what was relevant to those people two thousand years ago, three thousand years ago, is absolutely every bit as relevant to me today, in my historical and cultural context. Nancy: Now, archeology can sound kind of daunting. Where can you start? Jen: I tell people who are interested in learning their Bibles more consistently, that a good place to start (before you start trying to find some giant commentary to keep on your shelf) is to get a reliable study Bible (like The ESV Study Bible, or something like that). You can use that to help get you started with archeological questions. This gives you sort of a grasp on, "Where are we headed with this?" It won't be exhaustive, and I always urge people to if they can, look to at least two different sources, because you will see that there's not always agreement. At least you will have a feel for where the differences might come in. It's good to get our bearings from a study Bible before we start reading. Because I know how my heart is, and I know how most of us feel, once it's time to actually start reading the text and trying to gain comprehension, I ask people to put that study Bible back on the shelf. Part of the learning process is feeling the distance between where I am now and what I hope to know. When you're reading a book of the Bible and it comes up with a story that you don't have a file folder for and you're not really sure what it means, if you are reading it in a study Bible, you're going to feel that dissonance. Instead, let that signal to you, "Oh, the learning process is starting. I need to feel the extent of what I don't know." We're going to pop our eyes down, read those notes at the bottom, resolve that dissonance and move on. It isn't that we don't learn anything when we do that, but it's that that kind of learning is a far more superficial way to take in the understanding than if we do allow ourselves to wrestle with it and feel the . . . I call it "getting lost in the I don't know." I think when we are reading through a particular passage, the first important thing to ask is, "What genre am I reading? Do I have an understanding of the basic rules for this genre?" You read the Psalms a certain way, you read prophecy a certain way, you read Proverbs (wisdom literature) a certain way. Historical narrative has its own rules. We need to have an understanding of that as we read. Many books incorporate multiple kinds of genres, so it's always good to stop first and ask, 1) "What is this that I'm reading? Is it historical narrative or has it shifted into a poem at this point? How should I read that differently?" So, we start there, but then we need to start by asking comprehension questions and just nail down, "Could I paraphrase this in my own words if I needed to?" "Could I tell you what happened on Day Three of Creation after reading the Creation narrative?" These kinds of attention-getting questions ask if I'm really paying close attention to what I'm reading. So we start by asking those questions, and after we feel like we can answer those questions fairly well, we move on to, 2) "What does it mean?" We begin to ask interpretive questions: I start to ask, "What do I think is the point of this? Why was it written? What is it supposed to be communicating?" Again, this is a lot of times where Christians can de-rail, because we think, This is where I get to say, "What does this mean to me?" What we have to understand is that the biblical authors wrote with a meaning in mind, and they have determined a meaning. It is not my job to assign a meaning to a passage, rather to uncover the meaning that is there. That's what interpretation is doing for us. After we've gotten through interpretation, then we're finally ready to get to the questions that many of us are tempted to start with, that is, 3) "How should it change me?" Those are the three questions we can move through as we take a daily section of Scripture. Nancy: Jen Wilkin has been giving us some practical advice on reading God's Word purposefully. She also tells us how important it is to read it prayerfully. Jen: I like to think of prayer as the "secret sauce" for Bible study. It helps us get our posture right before the Lord even just beginning. I include it in my study method as the fifth of five techniques that we need to be using. It should be something we do before studying. We can ask the Lord to give us ears to hear and eyes to see. It should be something we do while we study. When you hit that passage that is convicting you personally of sin, or when you hit a passage that is confusing to you, confess those things to the Lord and ask Him to help you either to repent or to gain insight, whatever it is. If you feel your mind wandering, confess it to the Lord. Try to focus in again. So before, during, and then of course afterwards, we pray, "Lord, write these words on my heart. Let these divide me all the way down to thoughts and intentions of my heart." We ask Him to put that in that "savings account" and bring a reward on it, bring a return. Nancy: Now, when I look at the example of David or of Jesus, I see a pattern of seeking the Lord in the morning. That's what I try to do. I encourage women to seek the Lord first, for fresh manna each day. But I also know God may lead other women into different schedules. Jen says when you systematically approach God's Word and study it deeply, maintaining that discipline is more important than when you do it. Jen: The Lord knows our life stage and knows the strains on our schedule better than we do, so particularly for young moms or someone who is working just crazy hours (because they're in a season where that's what their job is requiring from them), whatever those things are that are pulling on us, we don't need to feel this guilt that, "I didn't make it happen at this time of day," or "It didn't happen in this particular way." There may be seasons in your life where, rather than fifteen or thirty minutes a day during your week, you had two hours on a Thursday and that's all you had that week, but you spent those two hours working through something. I would even argue that there are times where a two-hour block every several days or once a week is actually more beneficial than a ten-minute hit here and here and here. So it might be good to let yourself off the hook and say, "Every Thursday, for this season of time, I'm going to set aside these hours, and I'm going to give that time to a systematic study of Scripture." Nancy: When you study God's Word, it doesn't just affect you. You're setting an example for others. One of the best ways to encourage your children and grandchildren to study God's Word is through your example. Jen: Children are going to do what is modeled for them. You can try to structure for them, "Hey, go and study on your own," and I think that's actually admirable. But I think the biggest thing that has contributed to the study habits of my own children has been knowing what their mom and dad do. So if you model for them personal study, it's going to have a huge impact on whether they value it or not. Then if you in turn are gathering as a family and talking about something that . . ."Hey, read this beforehand, and then we're going to get together and discuss it as a family," you're setting up for them this beautiful rhythm of "alone" and then "together." It shows them that we have this time of personal responsibility for the Scriptures and then a time of corporate celebration and learning together—where we build each other up. Nancy: We'll hear more from Jen Wilkin in just a moment, but first I want to tell you how to get a copy of her book Women of the Word. In this book she shares even more than we've heard today about some of the ineffective ways we tend to approach God's Word. More importantly, she gives us some practical instruction on how to study God's Word effectively. We'd like to send you a copy of Women of the Word when you support Revive Our Hearts with a gift of any amount. You can understand the Bible, interpret it correctly and apply it accurately. Learning to do this is one of the most important things you can do in your walk with the Lord. Your gift to Revive Our Hearts today will help us continue pointing women to God's Word so that they can find the freedom, fullness, and fruitfulness in Christ that they need. When you call with your donation, be sure to ask for your copy of Women of the Word. The number to call is 1–800–569–5959, or you can visit us online at ReviveOurHearts.com. I'm so excited that Jen Wilkin will be joining Revive Our Hearts for our Revive '15 conference, coming up in September. The theme of that conference is, "Women Teaching Women." Now, why that theme? Here's Jen Wilkin on why it's so important. Jen: I believe women need women teachers because we have an empathetic authority over our listeners that men teachers don't necessarily have. Men teaching women is a great and needful thing, and it is no way diminished by the fact that God has given the gift of teaching to women as well. God does not give gifts for no purpose. If women have the gift of teaching, then it must not just be nice for the Body, it must be absolutely essential. That means it's incumbent on the church to find ways to equip and empower women teachers to walk out in their gifting and build up the Body—particularly women who need to hear from other women: "This is how I see the Lord working in my particular sin patterns; this is how I see the Lord working through women as members of the body of Christ." Women are going to see things from a different angle than men do, and that's a great thing. That's a gift from the Lord. Nancy: So, the body of Christ needs women who will teach other women. How can you know if you're called to be a teacher? To you it may seem intimidating to think of yourself as a teacher. Jen: I think that no one who is truly wanting to teach, and teach well, ever feels entirely comfortable. I still feel inadequate every time I stand up to teach. I don't think we ever want to lose that feeling. But initially, when you're setting out, ask, "Am I a teacher? I think maybe I am." I think there are some signs. I think you will have a deeper interest level in pursuing some of the things that are coming up in the Scriptures, than maybe other people around you. I think our first reaction can be, "Why doesn't anybody else care about this as much as I do? Are they just lazy? Are they just not as good a believer as I am?" or something like that. Maybe what it is, is that the Lord has given you insight and an interest level greater than theirs because you're moving toward wanting to teach. Then, if that's the case, it's so important to find someone else who can help you along that path. If you're in a big enough church, there's probably another woman who can help you with that. If you're in a very small church, it may very well be that you should approach your pastor and say, "How can you help me? Can you point me to good resources? Is there a place I can start trying this?" I think sometimes we think, Oh, I've got to start with a group of twenty women. It's got to be a twelve-week study. I'll just see if I'm any good at this. But it's much better to gather a group of three or four friends and say, "Would you give me four weeks this summer, and let's go through one of Paul's short epistles. I just want to try teaching this, and you can give me feedback. Let's just see how it goes." Nancy: Is it possible the Lord might want you to invest in other women in that way? If that's something you're already doing, or perhaps just considering, we hope you'll join Revive Our Hearts for a conference this September 25–26 in Indianapolis, Indiana. That conference is Revive 15: Women Teaching Women. Our guest today, Jen Wilkin, will be there with me, along with other friends who have a heart to communicate God's Word to women. Jen: I'm excited to be a part of Revive '15, because I believe the Lord cares deeply about women being raised to teach other women. I believe He cares deeply about the equipping of the members of the church who make up over half of the people filling its seats. My hope is that the conference will achieve for us the beginnings of getting a critical mass of women in place who are equipped and confident to go out and teach other women the Scriptures. I think we do this well with men more. Typically, there are just more avenues for this to happen. I love that the conference is addressing what I perceive to be a big need—having avenues for women to gain the tools that they need, and to have next steps on where to go. Maybe I'll realize, "I don't need a head on a video in a room full of women to make sure that this is a good Bible study." I want there to be a confidence level that grows among church leadership and among the women themselves that, "Hey, I bet our body of believers has a woman here who is dying to teach. Given the right tools and the right oversight, she can dispense that responsibility well to the glory of God and our whole body will be edified." If you are sitting there thinking, Maybe I'm a teacher, maybe I'm not. Oh, I can't possibly be a teacher! This is probably something you should come and check out. You'll have a chance to be exposed to what some processes are and what some ways of thinking about teaching are, that are going to throw into relief for you. "What are my motives? What are my hopes? What are my immediate capabilities? How far do I need to go? How far I am to how far I need to be to begin to explore whether I should gather a group of women to do this?" Also, I think it will be great chance to ask the question, "How deeply do I perceive this need? And perceive that not just in my own life that is maybe a gifting that I have, but how deeply do I perceive this need for the church?" Nancy: The Lord may very well be calling you to teach other women! In fact, if you are an older woman (whatever that means! ), then according to Titus 2, you are called to teach younger women. All of us are to be aspiring to pass the baton of biblical truth on to the next generation. For some that may mean public speaking; for others it may mean leading a small group or mentoring a teenage girl in a coffee shop. No matter what it looks like for you, I hope you'll come and be encouraged and equipped to teach more effectively by joining us a Revive '15. Again, that conference is coming to Indianapolis September 25–26. And when you register by June 30, you'll still get in on the early registration price. For all the details, visit us at ReviveOurHearts.com.